About: Maharashtra Common Entrance Test for Law (MH CET Law 2019) is a national level exam conducted by the Directorate of Higher education for candidates interested to pursue law courses in Maharashtra. Conducting Authority: Directorate of Higher Education, Maharashtra conducted the MAH CET Law entrance test 2019. Programs: Candidates looking for admissions in three years LLB Course and five years integrated BA LLB Course offered in law college of Maharashtra state. Eligibility: The students who wish to appear for the MH CET Law exam should be aware of and should fulfil the eligibility criteria. Admission Procedure: Candidates can secure admission in a college of Maharashtra state. There are 12 Law Universities/ Colleges in Maharashtra which will be participating in MH CET Law 2019. Candidates applying for the 3-year program can grab a seat from the total of 15040 seats across 218 colleges affiliated to 12 state universities. Syllabus: MH CET Law 2019 syllabus includes Legal Aptitude and Logical Reasoning, General Knowledge and Current Affairs, Logical and Analytical Reasoning and English. Maharashtra Common Entrance Test for LAW. Exam Date: The MH CET Law 2019 Exam for 3 years LLB is tentatively scheduled to be conducted on 17th June 2019. Exam for the 5 years BA LLB is scheduled on 22nd April 2019. Application Form: The application form for 3 years LLB course will be available on the official website from 16th April 2019 and the last date to complete the registration process is 16th May 2019. Admit Card: The admit card for 3 years LLB course will be available from 11th April 2019 on the official website. Counselling: Once the results are out the shortlisted candidates will be called for the next round of the selection process, which is the Counselling. Counselling for the admissions to the Law course starts on 6th June 2019. Other Important Dates: Candidates must be up to date with the MH CET Law 2019 Important Dates and schedules. Education Qualification: The candidate has to score at least 45% from a recognized Central/ State board in his/her 10+2 exam for 5 years BA LLB programme and for the 3 years LLB programme, the candidate must have a graduation/ post graduation degree from a recognized university or institution. Nationality: Candidates need to be the citizen of India to be eligible for applying in the MH CET Law exam. Age limit: As per the MH CET Law notification, there is no maximum age limit to qualify for MH CET Law 2019 Eligibility Criteria. Final Year: Candidates who are pursuing in the qualifying exam are also eligible to apply for the MH CET Law exam. Available: MH CET Law 2019 application form is available on the official website from 28th January 2019 and the last date to fill the application form is 22nd April 2019. Payment: MH CET 2019 application fee is paid online. The fee for General category is INR 800/-, and for OBC/SC/ST is INR 400/-. Submission: Before submitting the application form candidates need to recheck all the details because once it is submitted it cannot be changed. Admit Card: After filing the application form details on the official website, candidates should check regularly for the release of the Admit Card. Please feel free to check the details of the Application Process from MH CET Law 2019 Application Process section. Download: Admit card will not be sent from the post, it will available only on the official website and the candidate can download MH CET Law 2019 admit card from the official site. Documents: In the examination, day candidate needs to carry MH CET Law 2019 admit card along with valid identity proof. Information: The admit card contains the details of the exam centre, exam date & timing, candidates name & roll number which is printed on the admit card. Centres: The MH CET Law 2019 exam will be conducted in the state of Maharashtra at multiple exam centres. Own Preference: The candidates will be provided with the provision of selecting their preferred MH CET Law 2019 Exam Centre while filling up the application form. Venue: Details of the examination venue, address and timings will be clearly mentioned on the admit card. Mode of Exam: The MH CET Law 2019 Exam will be in online mode and will be in two languages i.e. English and Marathi language. Timing: The MH CET LAW 2019 Exam Pattern allow the candidates to write the exam for 2 hours. Marking Scheme: In MH CET Law 2019 MCQ based question will come having maximum marks of 150 and there will be no negative marks for the wrong answer. Topics: The MH CET Law 2019 Syllabus includes Legal Aptitude, Logical Reasoning, and Analytical Skills, General Knowledge, English, Basic Mathematics. Alert: As every year the examination authority makes changes in the syllabus so the candidate is advised to check the official notification for the syllabus. Books: There are a lot of books to refer for the examination which has been referred by the authority. Available: The MH CET Law 2019 Result will be available on the official website on 7th May 2019. Merit List: A merit list will be prepared based on the score of the candidates in MH CET 2019 examination. Depending on the merit list the candidates counselling process for admission to the courses will take place. Scorecard: Candidates are advised to retain multiple photocopies of the scorecard until the admission process is over. Allotment: If the cut-off is clear by the candidates they can register themselves for the counselling. Seat allotment process takes place through online mode by means of Centralised Admission Process (CAP). Marking Preferred colleges: Candidates who are applying for online counselling process can choose between Freeze and Float options to mark preferred colleges. By paying the counselling registration fees candidates can register themselves for the counselling process. Preferred Colleges: Participating candidates are advised to use Freeze and Float options to mark preferred colleges. Reservation scheme is defined for governing the admission process in MH CET law colleges admission. The rule is uniformly applicable to Government, aided professional educational institutions and aided undergraduate degree departments/ courses in law in non- agricultural universities. 85% seats are laterally reserved for students of the state of Maharashtra in all the Government/Government aided/ Government aided minority institutions/ University department/ courses. 10% seats are reserved laterally for students from all over the country in all the Government/Government aided/ Government aided minority institutions/ University department/ courses. 5% seats are reserved under the NRI/OCI/PIO quota for foreign nationals or Indian candidates with foreign nationality in all the Government/Government aided/ Government aided minority institutions/ University department/ courses. In unaided institutes, there is no minority quota and 65% seats are reserved for students of Maharashtra state. 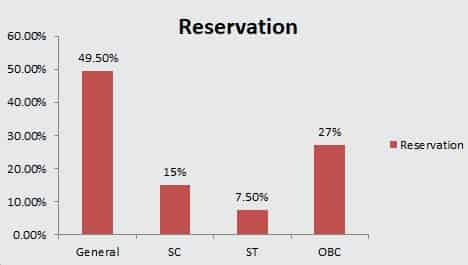 In unaided minority institutes, 51% seats are reserved for minority candidates. 20% seats are directly reserved for NRI/OCI/PIO/Foreign candidates in all the unaided institutes. This includes the 5% quota defined for NRI/OCI/PIO/Foreign candidates. Overall Difficulty level: The candidates who wrote MH CET Law 2018 felt that the difficulty level of the examination was a mixture of Moderate to Tough. Time limit problem: Candidates felt difficult to complete the Mathematics in the given time compared to the others. Application form Availability: The MH CET Law 2019 online application form will be available from 28th January 2019 and the last date to fill the application form is 22nd April 2019. Admit card release: The MH CET Law 2019 admit card will be released on the 10th April 2019. Exam date: The MH CET Law 2019 exam will be conducted on the 21st April 2019. Results: The MH CET Law 2019 results will be published on 13th May 2019. Eligibility criteria regarding Nationality: In order to satisfy the MH CET LAW 2019 Eligibility Criteria the candidates should be an Indian national. Eligibility criteria regarding qualification for the five-year law programme: The candidate must have passed 12th standard or any equivalent examination from any recognized board. The candidate should have scored minimum 45% marks in the qualifying examination. (minimum 40% marks for the SC/ST category candidates). Eligibility criteria regarding qualification for the three-year programme: The candidate must have passed 12th standard or any equivalent examination from any recognized board. The candidate should have scored minimum 45% marks in the qualifying examination. (minimum 40% marks for the SC/ST category candidates). Eligibility criteria for pursuing student: Students who are appearing in the qualifying examination are also eligible. Eligibility criteria regarding age limit: There is no age limit. Note: Candidates who possess a 10+2 qualifying certificate through Open University system without having any basic qualifications will not be eligible. Application date: The application forms will be available from 28th January 2019. Website: The candidates can download the application form from the official website. Click: The candidates have to click on the "MH CET Law 2019 application form" link. Details: The candidate has to enter his/her basic details and verify the details. Upload Images: They must upload a photograph and signature and then pay the fees. Once the process is completed they must download and print the application form for future reference. Mode: The application form can be downloaded via online mode from the official website. Application fee: The application fees for the General category candidates is INR 800 and the application fees for the OBC candidates of Maharashtra state INR 400. Payment mode: The application fees can be paid via Debit Cards, Credit Cards, Net Banking, Cash Cards / Mobile Wallets / SBI Bank Challan slip. Details: The admit card contains details such as exam center, exam date & timing, candidate's name & roll number. Procedure: The candidates can download the admit card from the official website. The candidates have to click on the "MH CET 2019 admit card" link. The candidate has to enter their login details including the registration number and Date of Birth. Print: The admit card should be downloaded and printed. Mode: The admit card will be available online only. Mode: The MH CET Law exam is conducted in online mode only. Duration: The MH CET Law exam will be conducted for a duration of 2 hours. Maximum marks: The maximum marks is 150. Medium: The MH CET exam is conducted in English and Marathi. Legal Aptitude: The candidate will be tested on the basis of his/her interest in law, research aptitude, etc. General Knowledge of Current Affairs: The topics are history, geography, general science, economics, etc. Logical and Analytical Reasoning: Logical Reasoning tests the candidate's ability to identify patterns, logical link and rectify in logical arguments. Analytical Reasoning measures the candidate's ability to understand the structure of relationships and to draw logical conclusions about the structures. English: The topics are Vocabulary (synonyms antonyms and analogies etc.) proficiency ( idioms and phrases, one-word substitution, sentence improvement, and rearrangement, fill in the blanks etc.) English usages error, etc. Basic Mathematics: The mathematics questions will be set from the 10th and 12th syllabus. The topics are profit and loss, speed and distance, time and work, algebra, averages, permutation and combination and Venn diagrams. Result Date: The MH CET Law results will be declared on 13th May 2019. Website: The candidate has to visit the official website in order to see the result. Credential: click on the "MH CET Law" link then the candidate has to enter the user ID and password. Download and Print: The results will be displayed on the screen. Now download and print the results. The candidates can use the Freeze and Float option. Freeze – If a candidate selects the Freeze option to lock a seat then they cannot participate in the further rounds of counseling. They will be admitted to the option they have locked and will not be considered for subsequent rounds of counseling. Float – If a candidate selects the Float option then they can participate in the next round of counseling to secure admission in a college of higher preference and if they do not get any such option they can accept the offer from the previously locked option. Official Page: The candidate has to go to the official website and click on the 'New Registration' option to register for the counselling process. credentials: The candidate will be directed to the registration page where they have to enter the registration number then click on the "Save and Proceed" button. Details: The candidate has to fill in all the details and then choose the password, enter security pin and choose the preferred colleges. A final merit list is published and the candidates will have to select their colleges. FeeL Candidates will be issued an Admission Letter and they will have to visit the facilitation centres for verification of documents. Candidates need to remit the admission fee for securing a seat within the stipulated time. Eligibility: Student above 18 and having passed MH CET LAW or another entrance test like JEE. I took MH-CET entrance exam. The typical cutoff was 132. 12 pass and base on MH CET LAW exam and cut off is 95. The entrance exam for this college is MH CET Law. The candidate must clear the MH CET LAW exam and must have passed the 12th from a recognized institute. I want to take admission in Central India College of Law for LLB (Hons). Is it necessary to attempt for MH CET Law? Yes, you are expected to attempt for MH CET Law for enrolling yourself to LLB at Central India College of Law. You need to clear MH CET Law with good marks to be eligible for admissions to any law college under MH CET Law. What all can I use for Reference while preparing for MH CET Law? What would actually help me out? For a book to actually be of any help to you, you understand the content of the book itself. Some books may explain it in a certain way to you and the same will be written in another book in an entirely different manner. What is the exam summary for the MH CET Law 2017? What are all the participating colleges for the MH CET Law 2017? What are all the Important things to know about the MH CET Law 2017? Maharashtra Common Entrance Test for Law (MH CET Law 2017) is a state level entrance examination for law students conducted by the Government of Maharashtra.MH CET Law exam is organized for those students looking for admissions in LL.B (Three Year) and LL.B (Integrated-Five Year) programs offered by the colleges across Maharashtra. On the basis of the MH CET Law scores, many law colleges across Maharashtra offer admission to students into the law courses.